...as was Boeing 777-300 ZK-OKN. Note to Air New Zealand... please paint the rego in white paint! Flying the morning flight from Auckland to Whakatane yesterday (28 January 2017) was Air Chathams' classic Douglas DC-3 ZK-AWP... Looks as if the weekly flight is getting popular... a leisurely flight to Whakatane on a Saturday morning, a stay overnight and return on Sunday afternoon. Yet another Bandeirante... Eagle Air's ZK-MAS at Auckland on 30 January 1992... I did like this colour scheme on the Bandit. 7.30pm – 10pm: Gather at the Air Milford hangar (3 Tex Smith Lane, Queenstown Airport) for a social event hosted by Air Milford’s Hank Sproull and aviation historian Rev Dr Richard Waugh. Memorabilia, photographs, and book sales. Dominie ZK-AKY and veteran Cessnas ZK-BDE, ZK-BJY, ZK-BMS and ZK-CHK on display. Story telling time (bring any photos and other memorabilia items). $20 each to cover food and drinks –payable at entry. 1pm to 4pm: Luncheon and social time at Gibbston Valley Winery (1820 State Highway 6, Gibbston 9371 – 20 minutes’ drive from Queenstown). More time to catch-up with friends from the past. Open microphone time from 2.30pm. Each person will pay for their own lunch and drinks. 9am-10.30am: Palm Sunday service at Frankton Presbyterian Church (cnr Ross & McBride Streets). All welcome. Led by Aviation Chaplain Rev.Dr Richard Waugh. Will include presentation about Queenstown aviation pioneers and tribute to those who died in early operations (inc Geoffrey Houston, Eion Buckham, Alan Nicholas). Followed by refreshments, and memorial fly-past of veteran Dominie and Cessnas (weather permitting). Pass this information on to others; all former staff and families are very welcome. 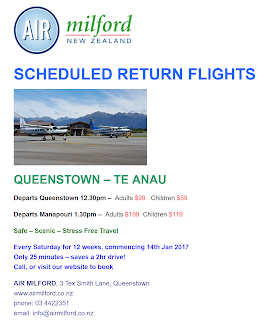 A new scheduled return flight from Queenstown to Te Anau could enhance Te Anau's growing tourism. Air Milford, a scenic-flight operator based at Queenstown Airport, landed its first commercial flight in Te Anau on Saturday. 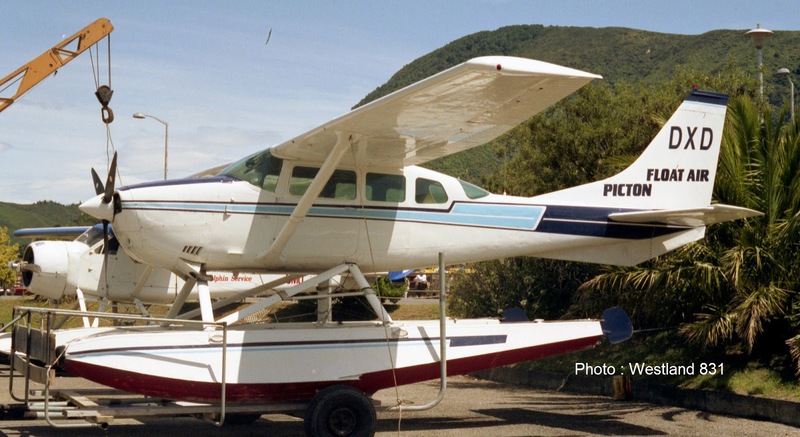 Operations manager and pilot Antony Sproull said tourism in Te Anau was booming and had never been stronger, so the scheduled flight would benefit the area. Te Anau is what Queenstown was a few years ago and the airport there made the area accessible for tourists, Sproull said. The Te Anau Airport had been largely unused for several years with scenic flights, helicopter flights and flights to the Chatham Islands being the main services, he said. The new service would utilise the airport. Destination Fiordland tourism manager Philippa Murrell said numbers of visitors to Te Anau had increased during recent years. "New Zealand is a safe place to travel," she said. According to the latest regional tourism estimates from the Ministry of Business, Innovation and Enterprise (MBIE), the total annual tourism spend in Fiordland increased from $27 million to $213 million in 2016, compared with 2015. "Reasons to visit are key to maintaining growth in a destination, so it is so exciting to have new products in Te Anau and Manapouri providing more variety for visitors and the new flight service provides another option for people to access our beautiful region," she said. The flight carried two paying passengers - Eleanor Pearson and her 8-year-old grandson Kayden Pei. It was Kayden's first time on a plane. The pair woke about 7am to be able make the 25-minute flight that showcased views of Mt Nicholas, Mavora Lakes, Von Valley and Lord of the Rings scenery, Sproull said. If the service was a success, a permanent service would be run through the summer time as fog and weather conditions in winter would be a hinderance, he said. Air Milford had been planning to introduce the service for two years. In February 2016, the company bought its third Cessna turboprop aircraft, making the company more flexible and better able to run the service. From the photo (see link above) the first service was flown by Air Milford's operations manager and pilot Antony Sproull in either Cessna Grand Caravan ZK-SKA or ZK-SKM. For the service to succeed I think it needs to be better advertised... I can find no reference to it on the Air Milford website... The fares are reasonable. I would have thought a good option would be to do an early morning TEU-ZQN and late return... With reasonable fares why drive to ZQN to catch flights to AKL, WLG or Australia and pay the ZQN parking fees. A once a week flight will also be difficult to market! Source : Te Anau Airport website. Back to Great Barrier Airlines' orange scheme again... BN Islander ZK-FVD at Auckland on 30 January 1992. It seems Fairchild Metro 23 ZK-POE flew what was most likely its last flight for NZ Post (Express Couriers) on Thursday the 19th of January as POST91/92 from Auckland to Palmerston North and return. Fairchild Metro 23 ZK-POF did its last flight two nights earlier on Tuesday on the 17th of January 2017. The two Metro 23s will be kept operational until the end of January however crew training has ceased and the crews are being re-assigned. Three of the four remaining pilots are about to start their Being 737 trainin g and the fourth is about to move on to something else. The aircraft are for sale so their final destiny remains unknown. They will join the two Fokker Friendships in storage after this month as they all await disposal. It seems that Fairchild Metroliner III ZK-POB was sold to Air Chathams in December. In September 1990 it was announced that New Zealand Post Ltd was forming a joint venture with Airwork (1984) Ltd to use two Metroliners to service main trunk route requirements for its express mail service, Fastpost. It was foreseen that the operation will fly two Metroliner III Auckland, Palmerston North, Wellington and Christchurch five days a week. Palmerston North was announced as the hub of the operation to avoid problems with the airport curfew at Wellington. The joint venture which was known as Air Post began Metroliner operations on the 15th of January 1991 with Metroliners, ZK-NSS, ZK-POA, and ZK-POB. 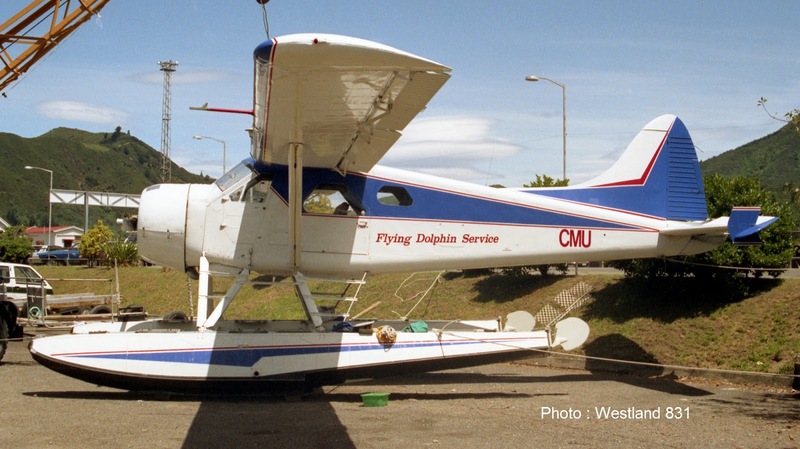 The two new Fairchild Metro 23s, ZK-POE and ZK-POF were added to the fleet in October 1994. Now just a memory - Air Freight (NZ)'s first Convair at Auckland on 30 January 1992. Remember when Great Barrier Airlines had an orange color scheme... Piper Aztec ZK-FMU at Auckland on 27 January 1992. Newly arrived Fairchild Metroliner ZK-POB at Ardmore on 25 January 1992. It's main use for the next 25 years was with Airwork on NZ Post flights... One wonders what its future will be! After posting the photo of Air Rotorua's Seneca ZK-FNB earlier this month I have been doing a little research and have started preparing a post on the operation. When you were flying the service who was operating it and who owned the business/aircraft. Did Leslie Aviation/Lakeside Aviation buy the Seneca and or commercial wing of the Aero Club or did Lakeside just manage it? There was for a time an additional Friday evening ROT-GIS-ROT service... did that last long? Capital Air had its origins in a company called Zephair Limited which was founded by Richard Molloy and Lisa Sheppard in November 2005. Flights began between Wellington and Takaka beginning on the 12th of January 2006 under the name of Capital Air. The first flight was flown by Piper PA-32R-301 Saratoga, ZK-ZIG (c/n 32R 8013045) by the Wellington Aero Club's Chief Instructor Dan Howe. The first flight arrived in Takaka at 5.20 pm in deteriorating weather conditions whereupon the pilot immediately announced he wasn't returning much to the shock of the waiting three passengers. Passengers were shuttled back and forth to flights from Nelson for the next couple of days while waiting for the weather to clear! Initially over the January holiday period four flights a week were operated and after, flights operated twice a week, on Fridays and Sundays, with additional flights over long weekends. A change to the company name was made in September 2006 when Zephair Ltd was renamed Capital Air Bookings Ltd. The company mainly used the Piper Saratoga but Beech 58 Baron ZK-WLV (c/n TH 698) was also used. The aircraft were based in Wellington and crewed by instructors from the Wellington Aero Club. In 2006 these flights ran until Queens Birthday weekend and then ceased over the winter months restarting in late September. In following years the flights ran from late September until late April with the frequency of flights increasing, especially during peak summer periods. During the peak season up to six flights were scheduled per week with additional flights operated on demand. Piper Saratoga ZK-ZIG with Capital Air titles at the Wellington Aero Club on 16 April 2009. In May 2009 Capital’s Air base was moved from Wellington to Takaka and the company was renamed Golden Bay Air Ltd to reflect its increasing commitment to the Bay.